Today’s post features a quick, flirty, feminine, and fun look I recently wore to a semi-casual dinner that’s perfect for this transitional period from Summer to Fall. With Fall approaching, I also wanted to use pieces that could easily transition now and into the coming months, so I opted for accessories in rich hues and varied textures, like these soft, suede, bow pumps in a rich, mustard-yellow; a leather, cognac satchel; and a matching cognac bow belt. I love accessories that add a little extra something special, and I think the bows on the pumps and belt do just that! Plus, they’re oh-so-cute! 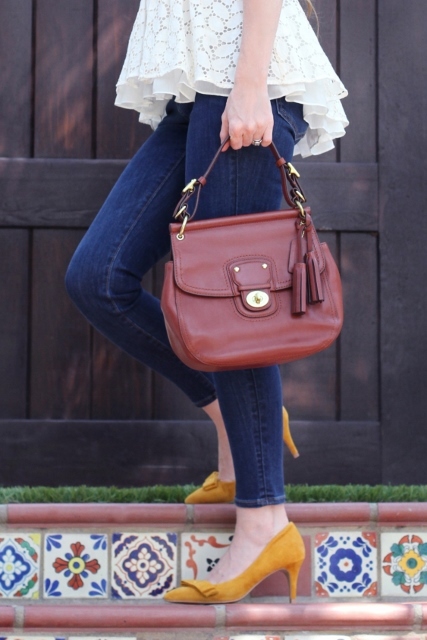 And who doesn’t love cognac with a pop of mustard for Fall? If you don’t have these exact pieces in your wardrobe, that’s more than okay! You can easily recreate this look with similar pieces you already have! You can also adapt this overall look for cooler temps by swapping out the pumps for ankle-booties and by adding a long, drapey cardigan or coat. A colorful blanket scarf would also look adorable! Thanks for reading, and have a wonderful Friday!